Originally published in The Patriot-News on September 12, 2011. Shawn Peterson of South Hanover Township hardly slept Thursday night. He spent much of it standing on a hill, watching as the water of the Swatara Creek engulfed the first floor of his home. “I was sitting on the hill just thinking, ‘Oh, God,’” he said. Peterson had lived there for 11 years. The worst flooding he had experienced in that time was easily taken care of by pumps in his basement, the water only reaching the top of the little hill his home sat on. This time, everything on the first floor and basement was ruined. Peterson had managed to move most of his more important belongings to the second floor, which was untouched. But the pile outside his home showed that not everything was moved. There sat a treadmill, TV, refrigerator and microwave. “We salvaged what we could, but it was all covered in mud,” he said. Going through his home was tough. He hasn’t let his 15-year-old son see it yet. Peterson pointed out mementos, pieces that triggered a memory. In one room was the soggy and ruined wooden floor, the very oak floor he and his dad had put in two years go. While the water might have receded, it is forever ingrained in Peterson’s memory. “Now I have to worry every time it rains,” he said. His home was not the only building under the creek because of the flood. The Hoss’s Steak and Sea House in Hummelstown was covered with more than 6 feet of water. The building has been gutted, and everything will have to go. 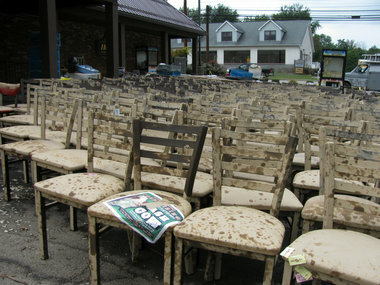 Rows of chairs, tables, canned food and appliances sat outside the restaurant, covered in mud. “We’re not sure what we’re going to do,” said Rob Billet, district manager for Hoss’s, who was supervising the cleanup. “The Swatara has come out in the parking lot before, but never to the restaurant,” he said. The restaurant employs 60 people, Billet said. He is unsure whether the restaurant will reopen. If not, those waiters, cooks, hosts and managers would find themselves out of work.